The best part of State of the Union night was the rejection of Trump’s bullying, and the outlining by Donna Edwards of an alternative vision. 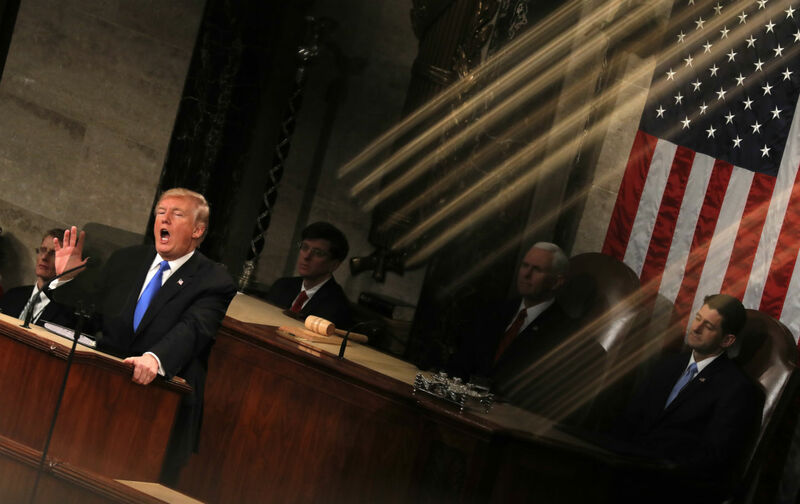 Donald Trump delivered his first State of the Union address 136 years to the day after the birth of the ablest of his predecessors, Franklin Delano Roosevelt. Roosevelt delivered epic State of the Union addresses that called a nation to overcome a depression and defeat fascism. Trump delivered a speech that will be forgotten by next week. Unfortunately, Trump does not accept these economic truths as self-evident. The entire focus of his administration has been to undo the New Deal, the Fair Deal, and Great Society progress of the past 85 years. Trump said a lot, delivering one of the longest State of the Union addresses in history. But he said little of consequence. The president’s address was a long and listless repetition of the right-wing themes that have defined his presidency: saber-rattling militarism, rejection of environmental sanity, neglect of domestic needs, and cruel stereotyping of immigrants. Trump’s “nativist lies about immigrants” were reprehensible, and anyone who suggests this speech was “presidential” is lying to themselves. It was heartless and harmful. The president who stood before the American people tonight is upending the rule of law, destroying institutions, and engaging in an unprecedented purge of the Department of Justice as Special Counsel Mueller closes in on him—all while congressional Republicans remain silent. From talk of building walls to travel bans, to devastating cuts to education, tax breaks for the richest among us, undermining voting rights and the rule of law, and attacks on health care, Trump’s policies have hit their mark. And as we heard from his speech tonight, he will continue to demonize the powerless while enriching the most powerful. Edwards ripped into Trump’s lies and cruelty with appropriate fury. But she also did something else. The candidate for county executive in Maryland’s Prince George’s County spoke of progressives who are running for local, state, and national office in 2018 on platforms that stand in stark contrast to Trump and Trumpism. That means remaking our government to actually work for the many and not just the few. We need health care for all. We need to end Trump’s tax cuts for the wealthy, and ensure our nation has the means to invest in our infrastructure, education, good-paying jobs and retirement security. We need to get big money out of politics, by making elections at every level publicly financed, cutting the cord with developers, banks, big pharma, oil and gas companies, and all the interests that control public policy in states, cities, counties, and Congress. We need to make it easier to vote, not harder. Easier to join a union, not harder. Easier to get a good education, not harder or more expensive. We should stand in the gap to restore the dream of DACA, and make sure police spend more time going after corporate crime than tearing apart immigrant families. We must transform the criminal-justice system so it serves to keep all communities safe, invest in accountable partnerships between law enforcement and communities, legalize or at a minimum decriminalize marijuana, end the mass-incarceration policies that put more people behind bars than any other nation in the world, and ruin millions of lives in the process, and invest in drug treatment, education, and jobs. We must refuse to leave our fellow Americans behind—half a million Americans are still without electricity in Puerto Rico and still desperately need aid. We must take seriously the threat of climate change and make a plan at every level of government to transition to a clean-energy economy by 2050 that will keep our air and our water clean and our planet alive. There was nothing of Franklin Delano Roosevelt in Trump’s State of the Union remarks.